When you use formulas with conditional formatting for a range of cells, it helps to understand in what order these rules are evaluated, what happens when two or more rules conflict, how copying and pasting can affect rule evaluation, how to change the order in which rules are evaluated, and when to stop rule evaluation. When two or more conditional formatting rules apply to a range of cells, these rules are evaluated in order of precedence (top to bottom) by how they are listed in this dialog box. Here's an example that has expiration dates for ID badges. We want to mark badges that expire within 60 days but are not yet expired with a yellow background color, and expired badges with a red background color. 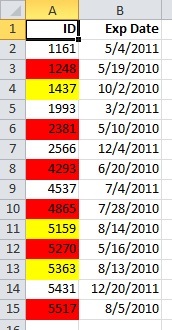 In this example, cells with employee ID numbers who have certification dates due to expire within 60 days are formatted in yellow, and ID numbers of employees with an expired certification are formatted in red. The rules are shown in the following image. The first rule (which, if True, sets cell background color to red) tests a date value in column B against the current date (obtained by using the TODAY function in a formula). Assign the formula to the first data value in column B, which is B2. The formula for this rule is =B2<TODAY(). This formula tests the cells in column B (cells B2:B15). If the formula for any cell in column B evaluates to True, its corresponding cell in column A (for example, A5 corresponds to B5, A11 corresponds to B11), is then formatted with a red background color. After all the cells specified under Applies to are evaluated with this first rule, the second rule is tested. This formula checks if values in the B column are less than 60 days from the current date (for example, suppose today’s date is 8/11/2010). The cell in B4, 10/4/2010, is less than 60 days from today, so it evaluates as True, and is formatted with a yellow background color. The formula for this rule is =B2<TODAY()+60. Any cell that was first formatted red by the highest rule in the list is left alone. A rule higher in the list has greater precedence than a rule lower in the list. By default, new rules are always added to the top of the list and therefore have a higher precedence, so you'll want to keep an eye on their order. You can change the order of precedence by using the Move Up and Move Down arrows in the dialog box. When rules don't conflict For example, if one rule formats a cell with a bold font and another rule formats the same cell with a red color, the cell is formatted with both a bold font and a red color. Because there is no conflict between the two formats, both rules are applied. When rules conflict For example, one rule sets a cell font color to red and another rule sets a cell font color to green. Because the two rules are in conflict, only one can apply. The rule that is applied is the one that is higher in precedence (higher in the list in the dialog box). While editing your worksheet, you may copy and paste cell values that have conditional formats, fill a range of cells with conditional formats, or use the Format Painter. These operations can affect conditional formatting rule precedence in the following way: a new conditional formatting rule based on the source cells is created for the destination cells. If you copy and paste cell values that have conditional formats to a worksheet opened in another instance of Excel (another Excel.exe process running at the same time on the computer), no conditional formatting rule is created in the other instance and the format is not copied to that instance. For a range of cells, if a formatting rule is evaluated as True, it takes precedence over an existing manual format. You apply a manual format by using the buttons in the Font group on the Home tab (Excel 2016/2013) or Cells group on the Home tab (Excel 2010/2007). If you delete the conditional formatting rule, the manual formatting for the range of cells remains. Manual formatting is not listed in the Conditional Formatting Rules Manager dialog box nor is it used to determine precedence. For backwards compatibility with versions of Excel earlier than Excel 2007, you can select the Stop If True check box in the Manage Rules dialog box to simulate how conditional formatting might appear in those earlier versions of Excel that do not support more than three conditional formatting rules or multiple rules applied to the same range. Evaluates only the first three rules. Applies the first rule in precedence that is True. Ignores rules lower in precedence if they are True. Rule one is applied and rules two and three are ignored. Rule two is applied and rule three is ignored. To evaluate only the first rule, select the Stop If True check box for the first rule. To evaluate only the first and second rules, select the Stop If True check box for the second rule. You can't select or clear the Stop If True check box if the rule formats by using a data bar, color scale, or icon set. The conditional formatting rules for the current selection are displayed, including the rule type, the format, the range of cells the rule applies to, and the Stop If True setting.